The beloved humorist and bestselling author returns with his most riotous collection of essays to date. 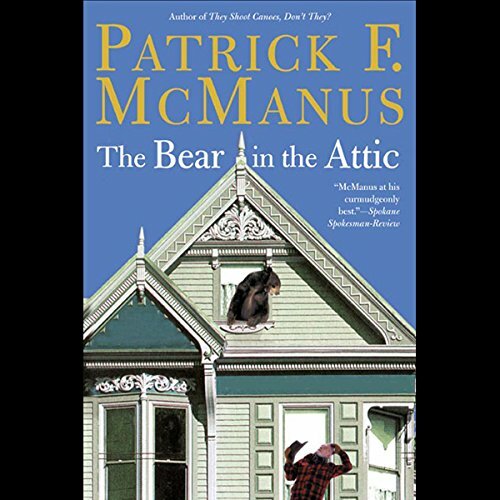 Starting with his trademark outdoorsman's wit, Patrick F. McManus's newest collection ponders the strange allure of the RV, the existential implications of being lost, the baffling tendency of animals to outsmart those who wish to hunt them, and the singular pleasure of doubling the size of every fish one doesn't actually catch. Combining the curmudgeonly voice of Dave Barry and the innocent tone of Garrison Keillor, McManus brilliantly captures the everyday absurdities that comprise our existence. Alongside his humor, McManus's inimitable vision consistently evokes a childlike wonder at the natural world. Even if we are running low on food, the compass is broken, and we are fairly certain we have just spotted a family of Sasquatches frolicking in the treetops, The Bear in the Attic makes the outdoors seem wildly irresistible. The first chapter is broken on this one. Great book, but this is a broken copy and completely ruins the punchline of the first story. I unfortunately own both, so I'm putting this here so you (and I) know the glitched one from the good one. long-time fan of Mc McManus; this doesn't disappoint. easy listening, great for the car. something I can listen to with the kids on the go. I’ve always enjoyed Patrick McManus articles and books. This was excellent as well. And the Narrator must have sat and listened to what I can imagine Mr. McManus would sound like if he were to read his stories himself. I can’t wait to buy another! What about Norman Dietz’s performance did you like? Norman Dietz does really well with giving each character their own voice, even though Pat is the most common one. There are times where the character of Pat rolls into these exasperated monologues, the end results showing his oblivious nature as the punchline, and Mr. Dietz's narration of these moments makes him sound a little like Deforest Kelley in his Doctor McCoy character. Dietz also does quite well with the character of Rancid Crabtree, whose dialect and accent is spelled out int the printed book in a manner that makes him somewhat difficult to read, perfectly clear while still maintaining the nature of the character. Fourty years ago I read his early books to my kids, in this book, he mixes in his personal life with his zany friends. I would recommend this book to those that want to learn about his early life and how to tell storys. the writing makes me believe that I'm listening to little kids discuss things. then you are drawn in and can not believe what mistake they are going to make. all are fun stories, great entertainment. This book is funny and great entertainment! It is for all ages, we love Pat McManus and his vision of his world! What did you love best about The Bear in the Attic? Wonderful set of tall tales. Right accent, tone and timing. Very troublesome reaction. While walking and listening I would burst out in guffaws..earning strange stares from those nearby. The performance was well presented but the story itself was, as a series of anecdotes, quite funny in places but a bit long/dry in others. Don't Try to Drive While Listening to this Book. Would you listen to The Bear in the Attic again? Why? I will for sure listen to this book again. The stories are fun and very funny for the most part. What was one of the most memorable moments of The Bear in the Attic? One of the Rancid Crabtree stories was so funny, we almost had to stop the car because we were laughing so hard. Patrick McManus manages to write about life in a way that can be serious but always finds the humorous side.